Everybody deserves a night off from cooking! 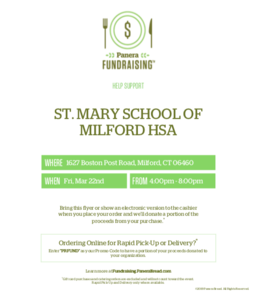 Visit Panera in Milford on Friday, March 22nd, between 4 and 8pm and a portion of the proceeds from your purchase will be donated to our school. Please just bring this flyer or show an electronic version to the cashier when you place your order. Thank you for your support!